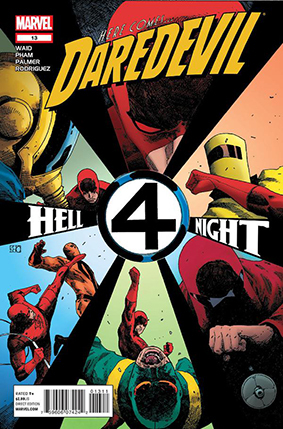 • DAREDEVIL #13 "Hell Night"
• PLOT SUMMARY: Written by Mark Waid. Art by Khoi Pham. THIS IS IT! 'Megacrime and Punishment' Be here as Megacrime strikes back at Daredevil! And Matt's 'happy go lucky' veneer at last begins to peel back, revealing... darker truths that may end his career as Daredevil. Artist Khoi Pham returns!